Isn't this Audrey Hamilton too? BTY, when you look at this picture Full Size, it looks like Audrey is braless, and... I don't know what to make of Peter Grant's trousers.... it doesn't look like they're buttoned up !! But... I think I'll just adirme RP for the Golden Rocker he his !! I never had the pleasure of running across Audrey Hamilton. It was reported that she cooled Jimmy down in a bar in Dallas in 1983 with a drink (the contents of being thrown).... Or, was it the other way around ? ? ? 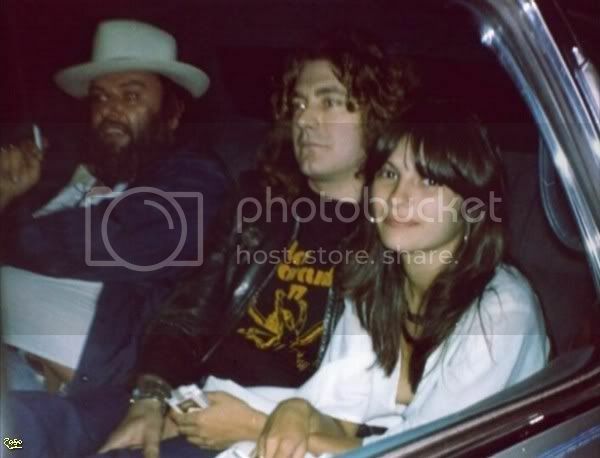 The 70's was a decade of open relationships - and not just for the Zep guys. I'm sure that there are some guys who were flattered that the LZ members found their women attractive. Both Audrey and Maureen are beautiful women. Robert sure had (still has) the way of charming the ladies!! Im sure he could charm the knickers off a nun!! LOL, you are probably right!! I love the way everyone assumes she is looking at Robert. We actually don't see who she is looking at! I think it's the music that has her so happy, anyway. Could one of you savy posters find a way to clip her pic outta the film??? I'm too lazy to go watch the whole thing. Location:... and she's from Canada! Audrey is so beautiful. And yes, that original pic which isn't here anymore, but I have seen, is very sweet, if not like "OMG poor Maureen... meh". My guess is it may have been something else that caused the split... losing a child can take a great toll. Of course, having something to do with her sister might explain a few things. The Ten Years Gone girl said it was the music or her. I think we all know what he chose. Relationships are complicated. And very private. Whatever their reason for divorcing, best left up to them. It's great they're good friends now and have raised wonderful children. This is true. Pretty much just thinking "out loud" as it were. He chose to be true to himself. I wonder why is Robert looking as if he doesn't want her to hug him, he even isn't hugging her too. Strange...BTW does somebody know why they divorced in 1982? With respect to you Maureen, I think that is private and their business. It isn't something to discuss here. As for the pic - there are others from the same session where they look smitten with each-other. Odd as it may look, it is only a split-second in time. Knebby, you're deadly right, having said that it's only their business and on noaccount should we discuss it. I wanted to ask about the reason for their divorce cuz the thread is called "Robert and Maureen?" and i thought i can ask it. Plus it has been discussed, e.g. in some interview Robert explained it but i don't happen to have it. He said that they just grew up......and apart. Fair question. He did answer it. By glossing over it with cliches. It isn't something he wants discussed. I completely understand that. He said all he wanted US to know in his lyrics at the time. I missed this but, definately that is not his ex wife, she is anglo-indian, a lot more elegant looking. Sorry but do you mean that it's not Maureen in the picture? I didn't fully understand you. I'm guessing it was what he needed; you must accept people for who they are. It's hard to say, but at some point she obviously decided the loss of consortium was an issue. Add to that the death of a child and it was probably too much strain on the relationship; people have to heal from those losses, so they find the best way to ease the pain. Many people get divorced after the death of a child.